In this present study, an attempt was made to investigate the efficiency of chitosan to recover a protein from sweet potato starch wastewater under various operating conditions such as agitation time, initial pH, chitosan dose and settling time. Four factors three level Box-Behnken response surface design (BBD) coupled with response surface methodology (RSM) was used to modeling the protein recovery process. From the BBD results, second order polynomial model was developed and its adequacy was evaluated by pareto analysis of variance (ANOVA). 3-D response surface contour plots were developed from model and it was used to study the interactive effects of process variables on response. Optimum operating conditions were determined using desired function methodology and were found to be: agitation time of 9 min, initial pH of 5, chitosan dose of 0.8 g/l and settling time of 35 min. Under these conditions, 95% of protein was recoverd. Recovered protein was analyzed and it could be used as a livestock feed ingredients. Electrophoresis, SEM analysis also used and myosin heavy chain bands at approximately 200 KDa, actin bands at approximately 40 KDa are obtained. Sweet potato starch processing industry generates very large amount of wastewater approximately 5.5 billion gallons per annum, which mainly contains very high organic loads associated with sweet potato starch losses . Particularly, sweet potato starch breaking section contributes a considerable amount of effluent generation and it primarily contains 56% of protein, which results high biological oxygen demand (BOD) and chemical oxygen demand (COD). Discharge of this untreated wastewater into the ecological system causes the negative impact on living aquatic species and human beings . The existing wastewater treatment system in sweet potato starch processing industry is based mainly on biological treatments of anaerobic and aerobic treatment process. These treatment processes are a quite inefficient and unfortunately leads to the environmental pollution issues due to the low removal efficiency of organic matters. Moreover, the nutrient source namely protein, available in the sweet potato starch processing industry wastewater cannot be effectively recovered for reuse after the conventional treatment process has been adopted . As a result of rapidly rising water scarcity and pollution associated with the ecological problems, tremendous volume of sweet potato starch processing industry wastewater requires a intensive treatment techniques to reduce the toxic matters as well as to recover the valuable byproducts, before its discharge. It is not only reducing the negative environmental impact due to discharge of wastewater streams, but also generate potential profits. On the other hand, protein is one of the most important ingredients used in animal feed. At present, with the rapid development in protein utilization, there is no enough protein to meet the need of the world, so it is important to find new sources of protein . Last few decades, several separation techniques such as membrane separation, ethanol precipitation, electro flocculation and coagulation  have been used for recovering proteins from various wastewaters. However, these techniques involve large number of critical steps, very large capital, and low removal efficiency of toxic matters, complex treatment setup and long retention time . Furthermore, scale up of these methods is very difficult and also expensive. Nowadays, application of natural biopolymers in wastewater treatment process gaining a considerable attention, due to its removal of toxic matters and recovery of useful by product . Among, various kinds of biopolymers, chitosan (poly (D-glucosamine)) is a natural deacetylated marine biopolymer which widely employed in a wide range of practical applications including wastewater management, pharmacology, biochemistry, and biotechnology due to the its excellent properties such as biodegradability, hydrophilicity, biocompatibility, adsorption property, flocculating ability, polyelectrolytic, antibacterial property, nontoxic, and its environment friendly nature . An extensive literature survey shows that there is none of research report was available on the treatment of sweet potato starch wastewater using chitosan to recover protein. Hence, the primary objective of the present study is to investigate the effect of process variables such as agitation time, initial pH, chitosan dose and settling time on protein recovery from sweet potato starch processing industry wastewater using biopolymer (chitosan). Because, high proportions of amino functions of chitosan may provide a novel binding properties for protein recovery from sweet potato starch processing industry wastewater. Moreover, Response surface methodology (RSM) coupled with Box-Behnken response surface design (BBD) was used to optimize and investigate the process variables on protein recovery and mathematical model was developed in order to predict the response value under the experimental range used in this study. RSM is an intelligent technique for response understanding and achieving optimized process conditions and has been widely used for wastewater treatment processes . Finally, the recovered protein was analyzed to use as a livestock feed ingredients using protein digestibility test. Electrophoresis, SEM analysis also used to examine the recovered solid. The wastewater used in this study was collected from sweet potato starch processing industry near Erode, Tamil Nadu, India and were stored at 4℃ prior to the experiments in order to avoid changes in the physico-chemical properties of wastewater. The characteristics of sweet potato starch processing industry wastewater used in the present study are shown in TABLE 1. All the chemicals (HCl and NaOH) used in this study are analytical grade and purchased from local suppliers from Erode, Tamil Nadu. Chitosan (powder) was purchased from Sigma chemicals, Chennai. Table 1: Characteristics of potato starch processing industry wastewater. Recovery of protein from sweet potato starch wastewater were carried in 250 ml conical flask containing 100 ml of composite sweet potato starch industry wastewater under various working condition such as agitation time (5-15 min), initial pH (2-6), chitosan dose (0.9-1.3 g/l) and setting time (10-50 min). Incubator shaker equipment was used to agitate the samples with desired chitosan dose which were allowed to settle at different settling time. pH of the wastewater sample was adjusted using 0.1 N HCl and NaOH. All the experiments were performed in triplicates and the results were presented as the mean value of the triplicates. Protein content in sweet potato starch wastewater water was determined using methods described by Lowry et al., . Settled sweet potato starch solids were dried in a drying oven at 70℃ and it was used to analyze the protein. In this present study, response surface methodology coupled with Box-Behnken response surface experimental design (BBD) was employed to investigate the individual and interactive effects of process variables on protein recovery using chitosan from sweet potato starch processing industry wastewater. Design- Expert 8.0.7.1 (State-Ease Inc., Minneapolis, MN, USA) statistical package. Agitation time (A), initial pH (B), chitosan dose (C) and settling time (D) were selected as independent variables, while protein recovery was selected as a response function. The detailed methodology used in this present study was reported elsewhere . 1 g of recovered sludge protein sample in 15 ml of water was heated and it was cooled for 20 minutes. After cooling, 5 ml of 0.02 M sodium barbiturate buffer containing 0.15 M sodium chloride (NaCl) and 5 mg of pronase were added. Then this reaction mixture was shaked vigorously and solids were separated by centrifugator. Again resuspended particles of the solids was heated in water bath and cooled. To this, 5 ml of barbiturate buffer and 5 mg of chick pancreas acetone powder were added and shaked well. Then the solids were finally filtered through a filter paper, air dried, weighed and analyzed for nitrogen (N). Protein digestibility (%) was calculated as follows . Where, A, B are Nitrogen present in the sample and indigested fragment respectively. 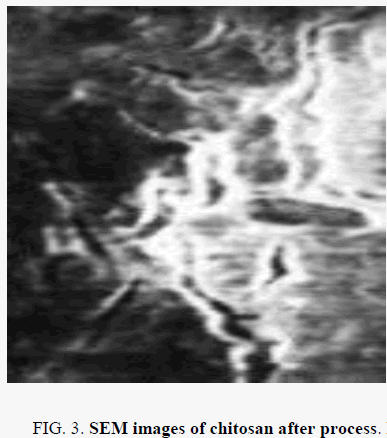 Scanning electron microscopy (SEM) analysis of recovered solid was examined at 25 kV accelerating voltage under the maximum magnification (20,000× ). In Electrophoresis analysis, the sodium dodecyl sulfate polyacrylamide gel electrophoresis system (SDS-PAGE) was used with a Photodyne Foto/Force 300 electrophoresis apparatus. The protein bands were visualized from the gels stained with Coomassie blue. In this present study, protein recovery was investigated using chitosan from sweet potato starch processing industry wastewater. According to BBD, 29 batch experiments were conducted and its results are shown in TABLE 2. Table 2: BBD experimental design with results. Then, BBD experimental data was investigated using two different multi regression analysis (TABLE 3 and 4) namely the sequential model sum of squares and model summary statistics  in order to select effective mathematical model to portray the protein recovery process. Where, Y1 is protein recovery; A, B, C and D are agitation time, initial pH, chitosan dose and settling time respectively. Then the adequacy of developed mathematical model was examined by constructing analytical plots (FIG. 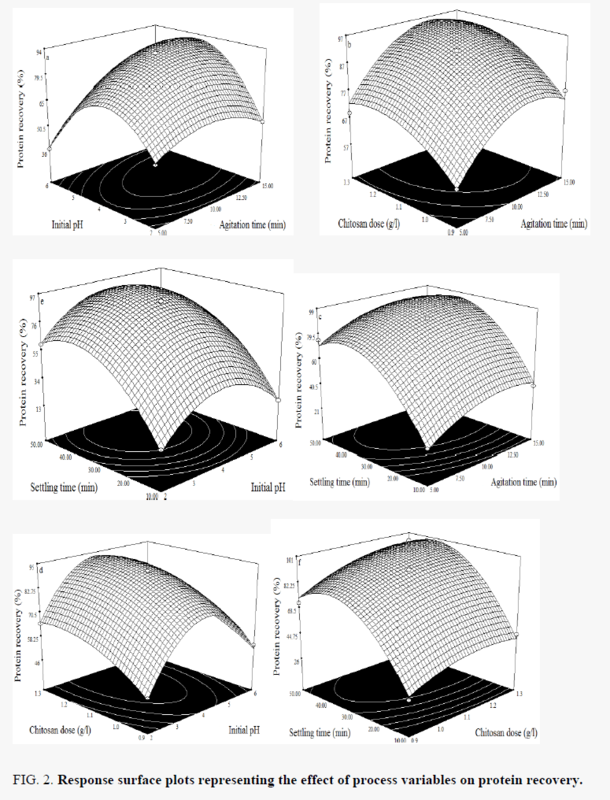 1) such as normal plot of residuals (FIG. 1a), residuals vs predicted (FIG. 1b), residuals vs run (FIG. 1c), predicted versus actual plot (FIG. 1d), externally studentized residuals (FIG. 1e), leverage (FIG.1f), which help us to find out the affiliation between predicted and experimental values and evaluate the model fitness. 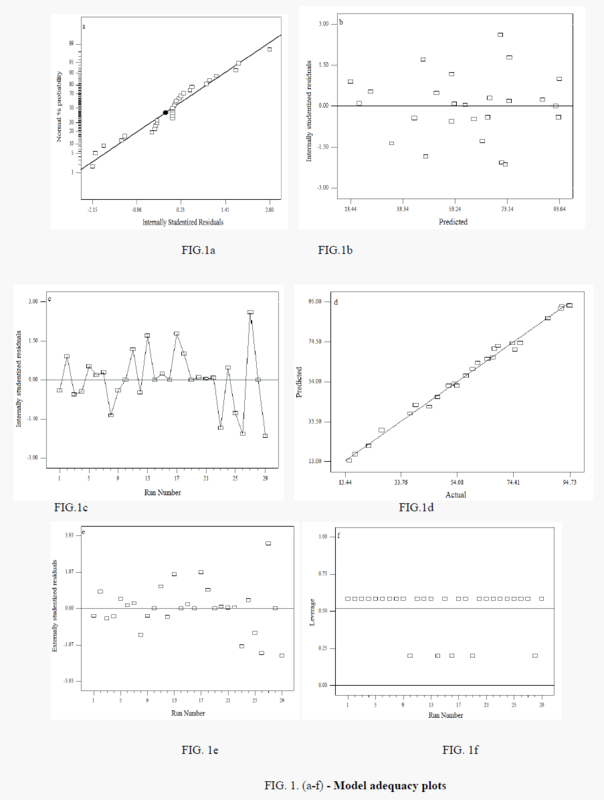 Figure 1: (a-f) - Model adequacy plots. Figure 2: Response surface plots representing the effect of process variables on protein recovery. Moreover, pareto analysis of variance (ANOVA) was used to analyze the experimental data and significance of the developed models equations were evaluated by their corresponding F- value and p-values (TABLE 5). The higher model F-values and lower p-values, adequate precision values (AP) and CV% values of the response demonstrated that the developed model was highly significant. From this results, it can concluded that, the developed mathematical models has the ability to describe the present recovery process very robustly [15,16]. Table 5: ANOVA results for protein recovery. It is very important that study of effects of process variables on the response in protein recovery process, which give the in depth knowledge regarding the treatment efficiency and mechanism behind the recovery of protein. So that, from the developed mathematical model, 3-D response surface contour plots are constructed in order to evaluate the effects of the independent variables on the response and it is given in FIG. 2. Agitation time is one of the crucial parameter influence the recovery of protein from sweet potato starch industry wastewater. In order to investigate the effect of agitation time on protein recovery, experiments were carried out in various agitation time (5-15 min) and the results are shown in FIG. 2. From the results, it is observed that, the recovery of protein is increased linearly with increasing agitation time upto 12 min. This can explained by the fact that, increases in agitation time up to 12 min would increase the adsorption of organic matters [17-19] present in the sweet potato starch wastewater on chitosan and enhances the protein recovery. However, agitation time beyond 12 min shows negative impact on protein recovery process due to breakdown of proteins. Initial pH is the key parameter influence the protein recovery process which mainly associated with surface charge of the chitosan. So that, experiments were carried out to study the effect of initial pH (2-6) on protein recovery. From the results, it is observed that, the protein recovery increased linearly with increasing pH from 2-4 (FIG. 2). This is due to the fact that, increase in pH up to 4 improve the solubility of chitosan and creates the -NH3+ ion  which enhances the protein recovery from sweet potato starch industry wastewater. However, initial pH beyond 4 resulted lower protein recovery, due to the decrease in the solubility of chitosan. Chitosan dose is one of the important process variables for protein recovery and it is associated with the adsorption/coagulation efficiency. To study it’s effect on protein recovery process, experiments were carried out in various chitosan dose (0.9-1.3 g/l) and the results are shown in FIG. 2. From the FIG. 2, it is found that, the protein recovery is increased rapidly with increasing the chitosan dose up to 1.1 g/l. This phenomenon could be explained by that, the increase in chitosan dose increases the reactive site to the effective adsorption/coagulation process which enhances the protein recovery . Beyond 1.1 g/l of chitosan dose shows the negligible protein recovery, due to the formation of equilibrium between chitosan surface and organic matters present in the sweet potato starch industry wastewater. The settling time is also an primary factor which influence the protein recovery process, effectively. In order to investigate the effect of settling time on protein recovery process, experiments were carried out with various settling time (20-50 min) and the results are shown in FIG. 2. From the FIG. 2, it is observed that, protein recovery is increased with the increasing settling time from 20-40 min. This can be explained by the fact that increase in the settling time would increase the floc aggregation and forms the compact, high density floc which increases the recovery of protein . Beyond the settling time of 40 min shows the negligible effect on the protein recovery due to negative impact of protein adsorption. Derringer’s desired function methodology was used to optimize the operating variables and it was found to be: agitation time of 9 min, initial pH of 5, chitosan dose of 0.8 g/l and settling time of 35 min. Under these conditions, the protein recovery was 95.54% with desirability value of 0.90. In order to validate the optimum operating conditions, triplicate experiments were performed under the optimized conditions and the results indicates (96% of protein recovery) the close agreement of experimental data with predicted value from developed mathematical model. These results demonstrated the validation of the optimized conditions of present protein recovery process from sweet potato starch industry wastewater using chitosan as an coagulant/adsorbent. Also, scanning electron micrograph (FIG. 3) of chitosan (after process) also confirms the recovery of protein on chitosan surface. 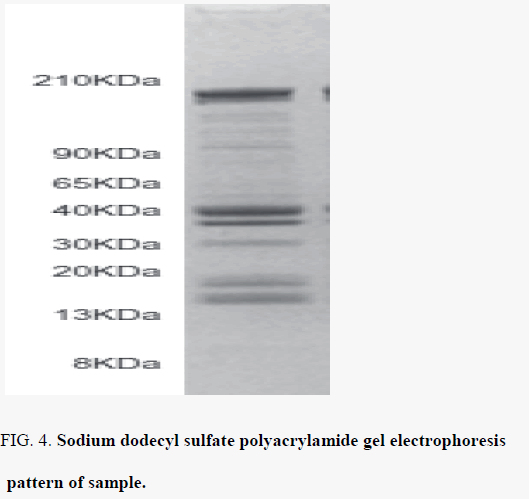 Also, sodium dodecyl sulfate polyacrylamide gel electrophoresis pattern of sample is shown in FIG. 4, which indicates that myosin heavy chain bands at approximately 200 KDa, actin bands at approximately 40 KDa are obtained. Figure 3: Effect of the column diameter on holdup. Figure 4: Electropolarization curves of Sn61Bi25Sb5Zn4Al3-XAg2(TiO2)X alloys. The protein present in the recovered solid is examined to find out the concentration of protein. It shows 40% of protein recovered using chitosan. The digestibility of recovered protein (104%) was determined and compared with proteins derived from corn meal (54%). These information exhibits that digestibility of recovered protein from the sweet potato starch wastewater is considerably higher than corn meal protein. This is due to the fact that that denaturation of proteins present in recovered sweet potato starch solid increases the digestibility of recovered protein . Hence, it is confirmed that the chitosan has the ability to recover the protein from sweet potato starch wastewater. In this present study, recovery of protein from sweet potato starch processing industry wastewater was examined under different process conditions such as agitation time (5-15 min), initial pH (2-6), chitosan dose (0.9-1.3 g/l) and setting time (10-50 min). Mathematical modeling of the present study was done by response surface methodology (RSM) coupled Box-Behnken response surface design (BBD) with four factors at three levels and second order polynomial models were developed from the experimental data in order to predict the response with high correlation coefficient values. Under the optimum operating conditions; agitation time of 9 min, initial pH of 5, chitosan dose of 0.8 g/l and settling time of 35 min, recovered the 95.54% protein. Digestibility of recovered protein shows that it can be used as a livestock feed ingredient. Present results exhibited that, chitosan is found to be a suitable natural biopolymer to recover protein from sweet potato starch processing industry wastewater by precipitation. Xu LJ, Sheldon BW, Larick DK, et al. Recovery and utilization of useful by-products from sweet potato starch processing wastewater by electrocoagulation. Poultry Science.2002;81(6):785-92. Xu LJ, Sheldon BW, Carawan RE, et al. Recovery and characterization of by-products from sweet potato starch processing plant wastewater using coagulants. Poultry Science. 2001;80:57-65. Sridhar R , Sivakumar V, Prakash Maran J , et al. Influence of operating parameters on treatment of sweet potato starch processing effluent by electrocoagulation process. Int J Environ Sci Technol.2013. Xiaolin C ,Cuiping, L, Xia J, et al. Recovery of protein from discharged wastewater during the production of chitin. Bioresour Technol.2008;99(3):570-74. Bourtoom T, Chinnan MS, Jantawat P, et al. Recovery and characterization of proteins precipitated from surimi wash-water. LWT-Food Science and Technology. 2009;42(2):599-605. Martí C, Roeckel M, Aspe E, et al. Recovery of proteins from fishmeal factory wastewaters. Process biochemistry. 1994;29(1):39-46. Sridhar R, Sivakumar V, Immanuel VP, et al. Treatment of pulp and paper industry bleaching effluent by electrocoagulant process. J Hazard Mater. 2011;186(2-3):1495-502. Ulmer Verlag Lowry O, Rosebrough N, Farr A, et al. Protein measurement with Folin-phenol reagent. J Biol Chem. 1951;193:265-275. Thirugnanasambandham K, Sivakumar V. Removal of ecotoxicological matters from tannery wastewater using electrocoagulation reactor: Modelling and optimization. Desalin Water Treat. 2016;57(9):3871-80. Quanhong L, Caili F. Application of response surface methodology for extraction optimization of germinant pumpkin seeds protein. Food chemistry. 2005;92(4):701-6. Sridhar R, Sivakumar V, Immanuel VP, et al. Development of model for treatment of pulp and paper industry bleaching effluent using response surface methodology. Environ Prog Sustain Energy. 2012;31(4):558-65. Rustom I, L ópez?leiva MH, Nair BM. Optimization of extraction of peanut proteins with water by response surface methodology. J Food Sci. 1991;56(6):1660-3. Thirugnanasambandham K, Sivakumar V. Influence of process conditions on the physicochemical properties of pomegranate juice in spray drying process: Modelling and optimization. Journal of the Saudi Society of Agricultural Sciences. 2015. Thirugnanasambandham K, Sivakumar V, Maran JP. Modeling and investigation of submerged fermentation process to produce extracellular polysaccharide using Lactobacillus confusus. Carbohydr Polym. 2014;114:43-7. Riaño B, Molinuevo B, García-González MC. Optimization of chitosan flocculation for microalgal-bacterial biomass harvesting via response surface methodology. Ecological engineering. 2012;38(1):110-3. Thirugnanasambandham, K Sivakumar, V Prakash Maran, J et al. Application of response surface methodology for optimization of chemical coagulation process to treat rice mill wastewater.2014a;9:237-47. Guzman J, Saucedo I, Revilla J, et al. Copper sorption by chitosan in the presence of citrate ions: Influence of metal speciation on sorption mechanism and uptake capacities. Int J Biol Macromol. 2003;33(1-3):57-65. Ngah WW, Ab Ghani S, Kamari A. Adsorption behaviour of Fe (II) and Fe (III) ions in aqueous solution on chitosan and cross-linked chitosan beads. Bioresour Technol. 2005;96(4):443-50. Crini Gregorio, Badot PM. Application of chitosan, a natural aminopolysaccharide, for dye removal from aqueous solutions by adsorption processes using batch studies: A review of recent literature. Progress in polymer science. 2008;33(4):399-447.